This article is a detailed comparison between Dokan Multivendor and WC Marketplace plugins. Both are multi seller ecommerce marketplace solutions on WordPress and based on WooCommerce. If you’re considering starting and managing an online business, checkout this comparison to see which solution is more suitable for you and meets your demands. The greatest of differences are in the little details! ⇒ Jump to full feature comparison. Get the Best WordPress MultiVendor Plugin & build an extraordinary marketplace! Find out which solution lets you create different marketplaces of extraordinary kinds. Become a multiseller eCommerce owner. Grab Dokan Now! The greatest differences are always in the precious nitty gritty details! Start your WordPress Multivendor eCommerce in minutes! Check out the detailed comparison! 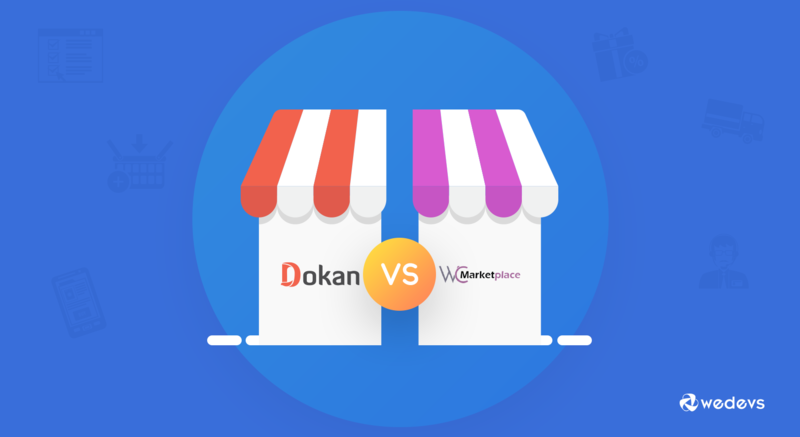 Choose the Best WooCommerce Multistore Plugin to build your WordPress Marketplace: WC Marketplace or Dokan? In a multi vendor eCommerce marketplace, the owners and/or administrators are in charge of everything. Therefore, it's crucial for a multi vendor eCommerce WordPress plugin to grant the right settings and features to the admins of a multi seller marketplace. The Admin Overview page is a crucial element in multi vendor marketplace websites. It provides an easy and at-a-glance summary of the marketplace that helps admins make important decisions and take instant actions while saving a lot of time. A marketplace plugin without an Overview page is a smartphone without notifications. 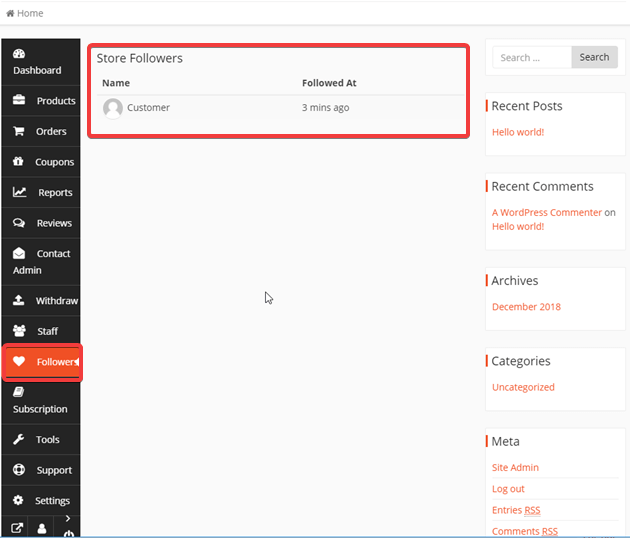 Dokan provides a nice and clean admin overview page where admins can view a summary of their marketplace at a glance. Not only is it visually appealing but it also shows important stats for the admins to get quick insights and take immediate actions. The admin dashboard shows net sales, number of products created, number of signups, pending vendors, commission earned and pending withdrawals for the month. The dashboard also provides a line chart to compare total sales, number of orders and commission for each day of the month. The Dokan overview also displays latest blogs and a subscription widget so users can subscribe to the newsletter straight from admin dashboard. WCMp doesn't have a dashboard for admin. The closest is a “Todo list” which shows the number of pending products for approval and the number of pending withdrawals. 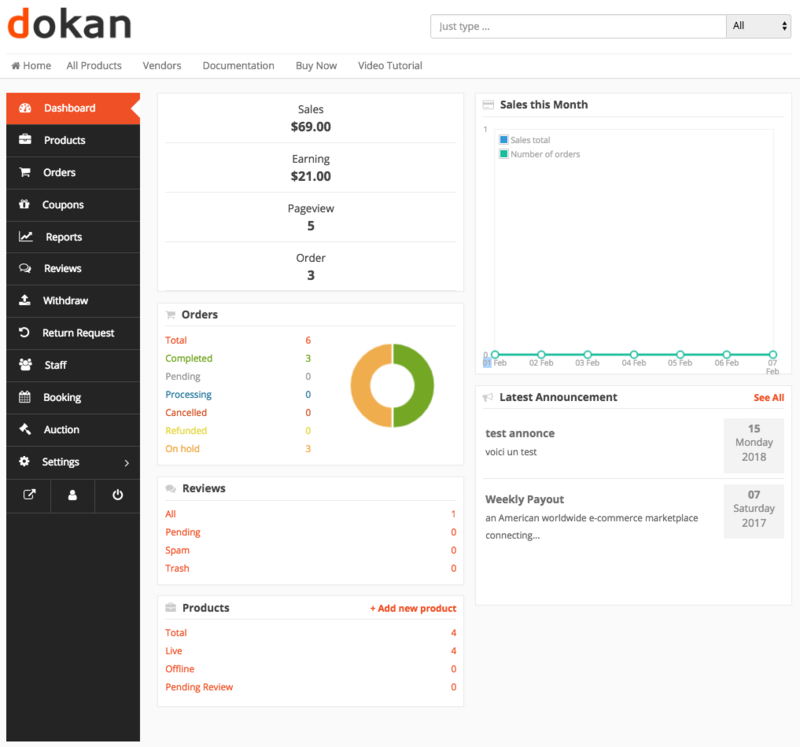 Insight: Dokan Admin Overview page is an important element in the backend of Dokan Multi Vendor Plugin. Since the owners of multi seller marketplace have to juggle with a lot of tasks, the Overview page is his most handy tool to stay up to date, remember important information, and to make quick conclusions. The visually attractive Dokan Marketplace Overview page is, thus, imperative for admins to understand the daily status of their marketplace and how well its performing. WCMp is missing out here. When you run a multi seller eCommerce business, you would need to manage their payments. In fact, lots of payments! As the administrator of the multi seller marketplace, you require having a easy-to-use dashboard that allows you to view and manage all payments in one go. And nothing can be better if you can handle it all from one place! Dokan Multivendor Withdrawal options are simple to use. With uncomplicated settings like withdraw threshold, withdraw limits, withdraw methods, and order status it gets hassle free for admins to setup global vendor payments. 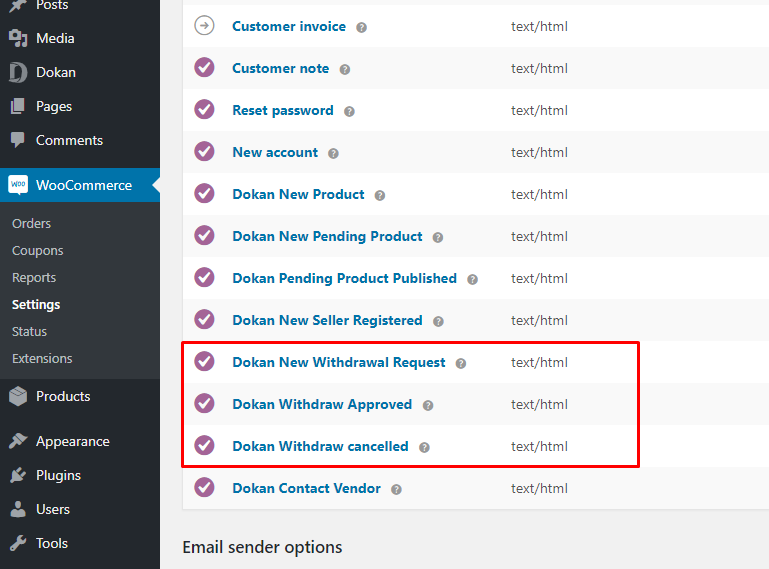 Dokan plugin also provides a withdrawal dashboard from where admins can approve, cancel and manage withdrawal requests. Dokan uses WooCommerce settings for its email so that admins can set up email notifications to send to vendors to inform about approved or cancelled withdrawals. Dokan Multi vendor admins can also set up the email they will receive when a new withdrawal request is made. With WCMp the withdrawal options can be difficult to understand for most marketplace owners. Most owners want some or all control over their multi seller marketplace, especially when it comes down to sensitive elements, like payments. WCMp allows admins to turn off that option for vendors to request withdrawals. So that payments can be disbursed automatically based on a withdrawal threshold or minimum waiting period. Admins can also set withdrawal schedules and charge vendors for withdrawals in WC Marketplace. The plugin also allows admins to receive the payment gateway charge from vendors. Insight: With so many aspects of our lives becoming digital and on the go, it only makes sense to ease the burden of remembering when to pay a bill and doing it manually. But when would you actually need to stay away from automatic payments? In the case of a multi vendor eCommerce marketplace, where prices, number of vendors and vendor situations are constantly changing, you would need to think twice before you really start taking advantage of auto payments. What if some vendors accidentally withdraw a payment twice? Or the vendor has changed his prices significantly so much so that the commissions you originally set doesn't make sense anymore? Moreover, you may also face certain unforeseen circumstances for which you may need to change the type and amount of commission you pay. Such problems are likely to just happen when you’re starting off your marketplace and redressing them takes time and effort. While WC Marketplace is endowed with more options for disbursement of commissions, the solution tends to provide a lot of power to admins at the cost of upsetting vendors. Dokan Multivendor, on the other hand, makes managing commissions more practical for the admins and provides a lot more control to vendors to request withdrawals by default. Thus when you give the option to request for withdrawals you allow a balance of control between the powers of the admin and the vendors. This helps the admins to review an order and a withdrawal request before disbursing the vendor commission. This is a kind of control that most site owners of multi seller marketplace would not mind. Dokan Plugin allows this option by default because this is an essential feature that allows balance to be maintained between the admins and vendors, and ensures accurate disbursement of commissions. Your sellers are the reason your multi seller eCommerce runs. The vendor station in the backend is the heart of every multi vendor marketplace. It's where admins and site owners can view all WooCommerce vendors who have registered. It is also the head quarters from where admins can manage vendors, approve them or deny. And directly view their status and profiles. The Dokan plugin vendor station is a core feature that smoothly filters all approved and pending vendors and displays important seller information at a glance. Who says everything in the Admin Backend has to be boring? 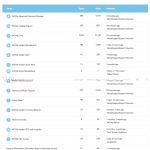 Dokan Multivendor Admins get to view vendor details in a beautiful and neatly organized colourful layout. The page wonderfully lays out in a pre-defined template all seller information: vendor address, number of products he/she is selling, revenue earned, total items sold, current balance, and other details all in a single page. It also shows the email, phone, registration date and status among others. Thus ensuring a great deal of user convenience. The Vendor Manager for Admins also shows the social profiles of the vendor and allows the admin to send an email right from the dashboard. Admins can directly edit basic vendor profile details from WordPress Users feature. The vendor manager for admins in WCMp is relatively less visually appealing and not user friendly. On top of that, the WCMp vendor manager for admins inadvertently grants a lot of control to admins to even change the store slug and store name of a vendor. It also lets admins do things that can already be done from the default WP Users page. The benefit to add a separate commission method and percentage for individual vendors may have been commendable but it's a hassle that most admins would rather not take. Insight: Dokan Marketplace Vendor Manager for Admins is simple and easy to understand for any type of user. This core feature smoothly helps admins view and manage their vendors without granting them too much control to change individual store information. It is void of unnecessary details and has just the right amount of features for admins to flawlessly take care of his vendors. A more friendlier Admin dashboard is hard to come by! As a marketplace owner, sometimes you need to broadcast reminders, messages, and notifications to the seller in your WooCommerce multi shop marketplace. To do this you need an announcements feature which is a logical, basic and central element of a WordPress WooCommerce Marketplace. Dokan Multivendor lets admins create announcements for selected or all vendors. While WCMp only allows announcements for all vendors. Imagine a situation where you have to notify only vendors selling auctionable items or physical items about a change in shipping taxes. Vendors can view these announcements from their dashboard. 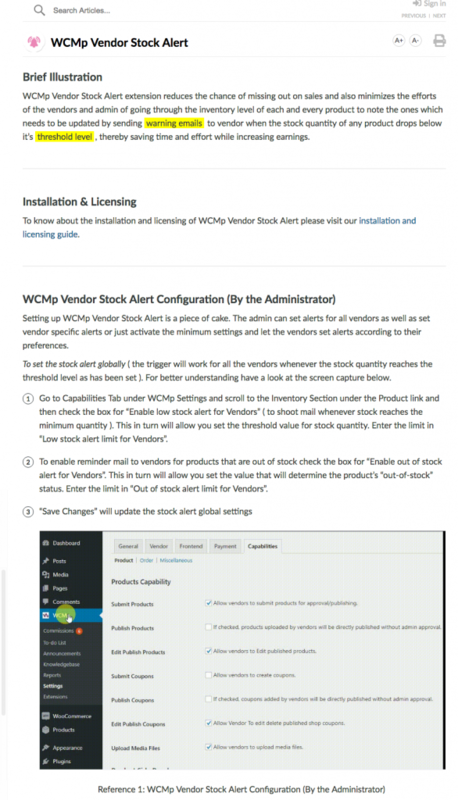 WCMp plugin only allows admins to create announcements for all vendors only. Admins cannot create announcements for selected vendors. Insight: Dokan Announcements feature is more rich as it allows admins to select vendors. An integral part of a WooCommerce Multi Vendor Marketplace is the ability to handle refunds and returns in a simple and flexible manner. Repayments are inevitable in an eCommerce multi store and vendors need to be well-equipped to handle these smoothly. A flexible refund mechanism also acquires customer satisfaction and ensures the reliability of vendors. Dokan Multivendor allows admins to directly manage refund requests and approve or cancel them from the backend. Vendors need to request for refunds manually from the frontend and have it passed through their admins. 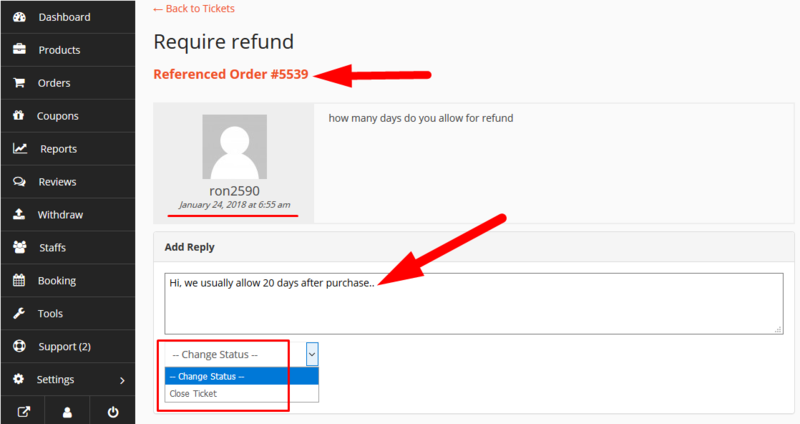 Admins can review the reasons for a refund and take an action accordingly. With a such a thorough procedure, the Dokan Multivendor solution ensures transactions meet the highest level of standards. Though extremely important, WCMp plugin doesn’t have an in-built refund dashboard for vendors and admins. Nor do they show refunded amounts in reports. 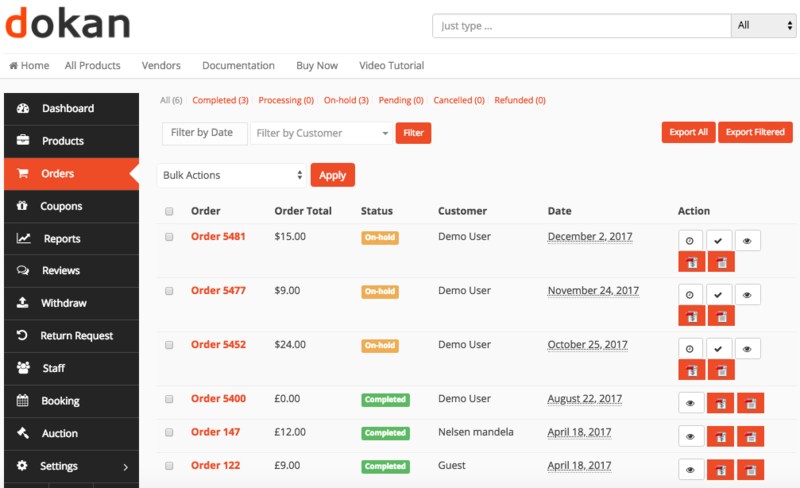 Insight: Dokan in-built refunds system allows both admins and vendors to keep track of orders that have been refunded. Both parties thus have a system that lets them calculate earnings at any range of time accurately. Reports are an integral part of managing a multivendor eCommerce. They state history and trends. Admins can spot best performing stores.They let site owners have an increased understanding of risks and opportunities. Reports also emphasize the link between number of products sold, total orders, and revenue earned. As a consequence they help admins create long term business strategy, policy, and goals. Dokan Plugin admin reports show stats by day, year, custom range, and by vendor. Admins can see the overall data for the number of orders placed, order total and the total earnings or commission. Admins can also view all the logs for each vendor and which product of theirs has been purchased along with status and vendor earning. WCMp admin reports also shows sales and earnings data by year, month, week and custom range. It also shows gross sales and earnings product and vendor wise. The reports help admins to compare sales against earnings for individual products and vendors. Insight: While WCMp reports are displayed in the WooCommerce menu along with WooCommerce reports, possibly for easier navigation, Dokan reports show admins just the right amount of data to be able to take pertinent decisions, such as total earnings and logs of all orders. Admins can view top products and how much they earned directly from WooCommerce reports, and other data can be found in Dokan reports. Sometimes you might need extra features to further customize your WooCommerce multi vendor marketplace. Such as, to create auction-able and rental products, to create wholesale products, to offer warranty, or to enable a help desk ticket system for registered users. To do this, you need to obtain what's commonly known in WordPress as ”extensions”. 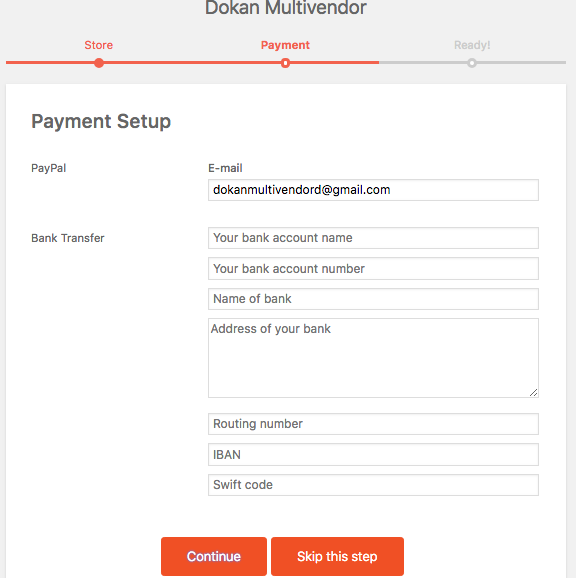 Dokan uses the modules system to offer extra features to your WooCommerce Multi Vendor site. While WC Marketplace uses add-ons. 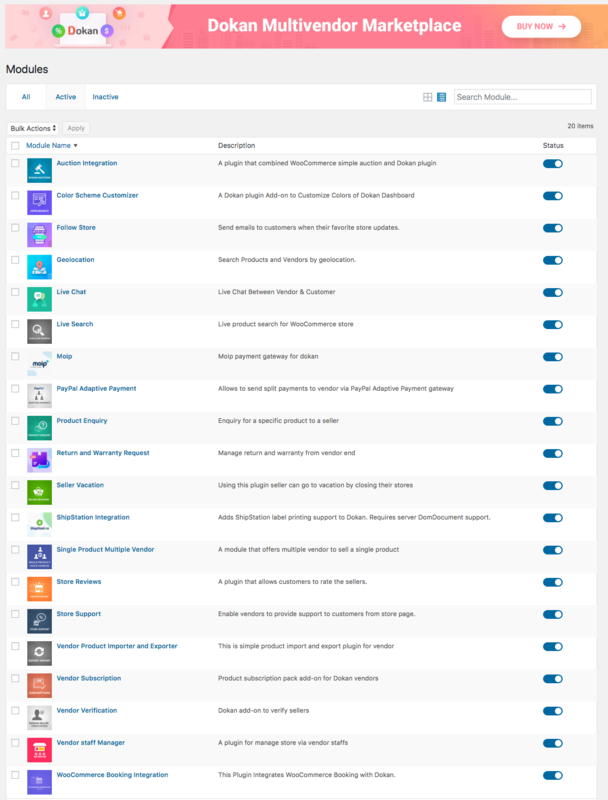 The Dokan plugin Module system lets users have an organized method of handling all their extensions from a single page. It’s easier than the default way of managing WordPress plugins because it’s superbly easy to activate and deactivate the extensions simply using the help of a toggle button. Admins get the benefit to turn on and off features as they require. The Dokan Multivendor modules page also provides an easy way to remember what the modules work for with brief easy to read captions. And a quick way to search a module is provided with the search bar. It keeps all your marketplace extensions in one place and separate from other plugins that you will be using to operate your WordPress Marketplace. WCMp Add-ons, on the other hand, don't do that plus you have to purchase them separately. Insight: When you're using a number of extensions to run your WooCommerce Multi Vendor Marketplace, the default WordPress Plugins repository becomes a disorganized page to keep track of all your WooCommerce Multistore extensions among all the other plugins that you will be using in your WP site. 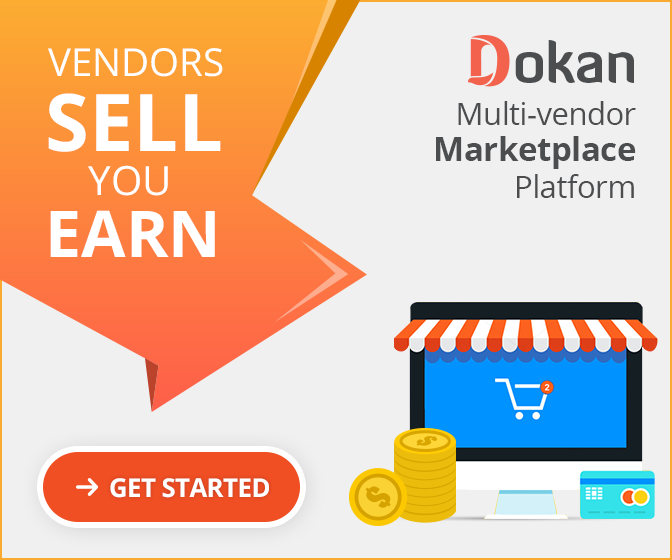 With the Dokan Multivendor Modules system, you not only get an organized system of all your multi seller marketplace extensions, but you also save more by buying the bundles. 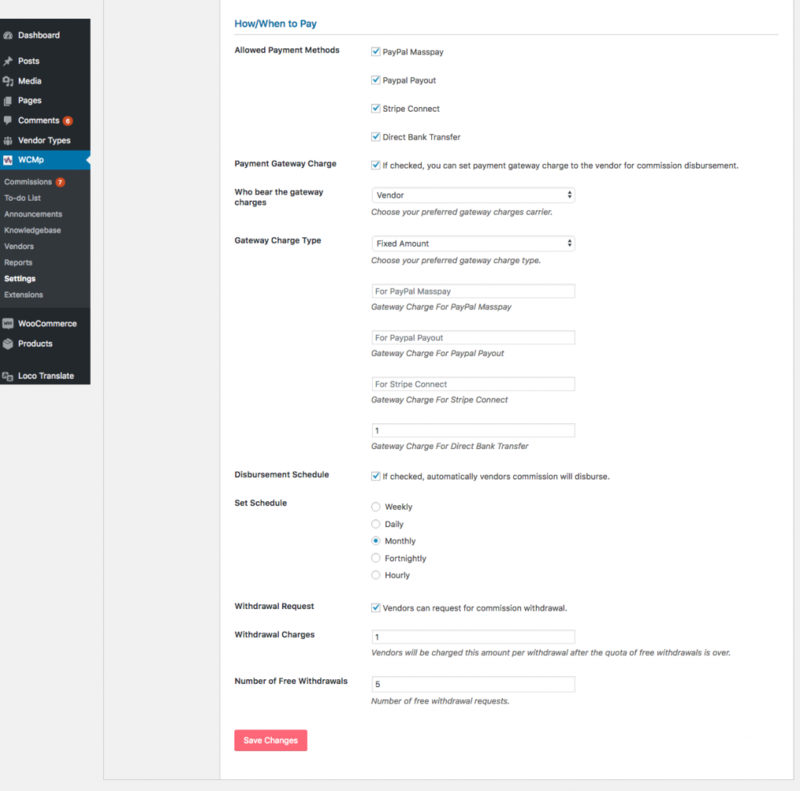 Dokan allows admins to configure and set up a host of emails for the different modules and several core feature and premium features using templates and WooCommerce settings. These templates allow admins to quickly set up the recipients, subject and message they want to send to vendors, customers, or themselves when different set of actions are triggered. WC Marketplace does not have its own in-built email templates and notifications for its features. This means if WC Marketplace users want to send customized emails for a feature that's not included in the default WooCommerce emails, they will need to have it developed. Dokan Multivendor Tools section is a very handy feature that lets admins set up all required pages for their WooCommerce Multi Store Marketplace automatically in a click. This section also checks for duplicate orders and re-builds order sync table. WCMp doesn’t have any such option. Insight: When a user is setting up his eCommerce marketplace website he needs to create a number of required pages in order to get started. And he can save a lot of time on this task if it can be done automatically. Useful handy features makes it easier for admins to keep their backend and the overall marketplace clean, organized and manageable. From time to time admins will also need to check for duplicate orders and this feature of Dokan easily scans the entire system within seconds and filters out the duplicate orders. Dokan updates and license are easily accessible from this section. This allows users to keep getting the support and updates relating to the plugin. WCMp doesn’t have a pro version but a handful of add-ons. They dont have a separate section within the plugin for users to upgrade license directly for paid add ons. Insight: Another handy tool for users to remain informed about their expiring licenses and have it upgraded from the dashboard, and not have to login to their account. Dokan plugin has a number of settings on vendor capabilities, selling options, withdrawal options, page settings, appearance and email. In Dokan, admins can allow or disallow vendor entry to dashboard by default. In WCMp admins are required to purchase an add on in order to restrict vendor access to wp dashboard. Dokan allows admins to controls if vendors can add store opening and closing times, which WCMp doesn’t. The plugin also lets admins control if vendors can have a Google map widget in their store page, alter the banner image dimensions, enable terms and conditions, and let vendors manage reviews from the frontend. These important features are missing in WC Marketplace. Dokan also allows admins to disable guest product inquiry, allow vendors to create product tags, allow vendors to select multiple categories for products, control new product status, allow vendors to add discount on products or orders and a lot more. Let vendors change order status and duplicate their own products. WCMp has settings on general, vendor, payment, capabilities. The plugin has a built in vendor registration form that’s customizable. Dokan appearance settings has 4 layouts whereas WCMP has 3 for vendor shops. Dokan also has an option to add email verification during vendor registration to avoid spams, fake emails, and for added security. Insight: Dokan settings are more detailed and the different categories allows easy management. Dokan commissions are of 2 types. Admins can set the minimum withdraw limit, order status and withdraw threshold. While in Dokan, vendors can request for withdrawals by default. If the marketplace in which their stores are built are using Stripe or MOIP modules, admins can allow automatic payments also. WCMp offers 4 types of commissions options that include % + Fixed per transaction and % + Fixed per unit. The plugin also allows admins to share coupon discount with vendors, set the tax and shipping charges on vendor and set the disbursement threshold and withdrawal locking period. Admins also get a commissions page in the backend where they can view history and details. Insight: WCMp plugin offers more commissions options to admins. The best solutions don't just come with great features but great customer support service as well. Support should be easily accessible, prompt, caring, responsive, and skilled enough to solve the problems. Dokan Multivendor customer service has a high ranking in WordPress.org forums, Trust Pilot, and in several sites who have reviewed the plugin. The team offers 24hr live chat, email, FAQ, and contact form for users and visitors to easily get in touch. Premium customers with valid licenses also receive priority support and get responses within 24 hours or less. Apart from this the Dokan Multivendor has a rich documentation house wherein a host of resources, tutorials, how-tos, guides, and videos are stored. Users get detailed instructions from installation to configuration to usage for each and every feature and module of Dokan Multivendor Plugin. The Help section in Dokan backend includes important get started guides, tutorials, and detailed instructions on the usage of features and modules. While the support of WCMp is highly appreciated, the team mainly provides direct support through their forums only. As the site mentions “Any support request raised through email, twitter and contact form will be simply be redirected to the support forums!” The team can be contacted through forms, but that’s not encouraged. The team prefers questions be posted in the forums so that issues remain open to public search and users can find solutions quicker. WCMp also has a very well-written documentations, which they call the ”Knowledge Base”. WCMp has a knowledge base section within the plugin for admins to upload any instructions or guides on their own for their marketplace. 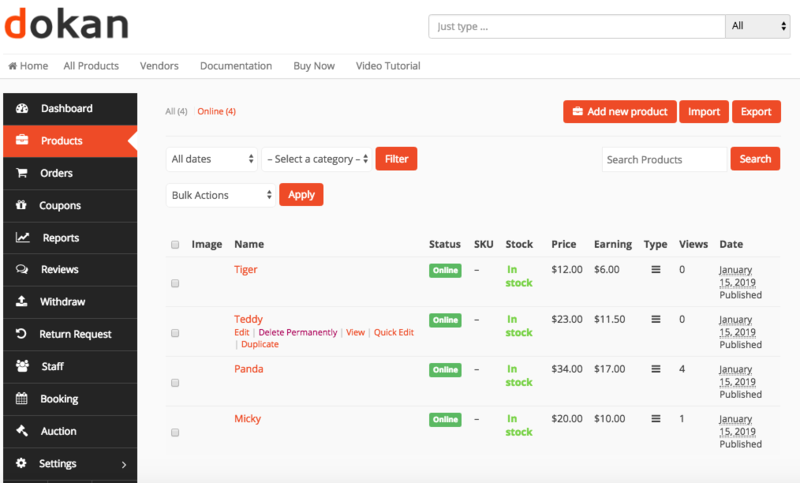 The WooCommerce Frontend for Vendors allows sellers to create items, products and manage their stores smoothly without getting into the admin backend. 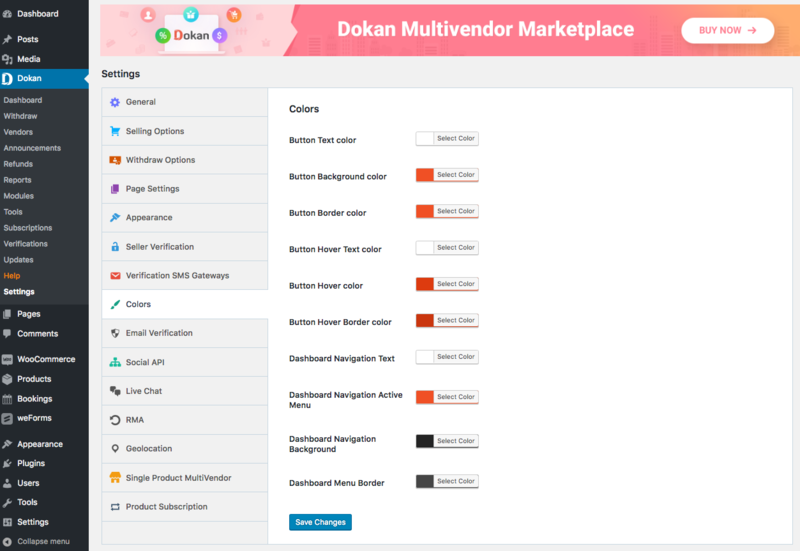 The WooCommerce Vendor Dashboard of Dokan Multivendor plugin has an advanced UI/UX with enriched capabilities that ensure a smoother and simple experience for vendors. 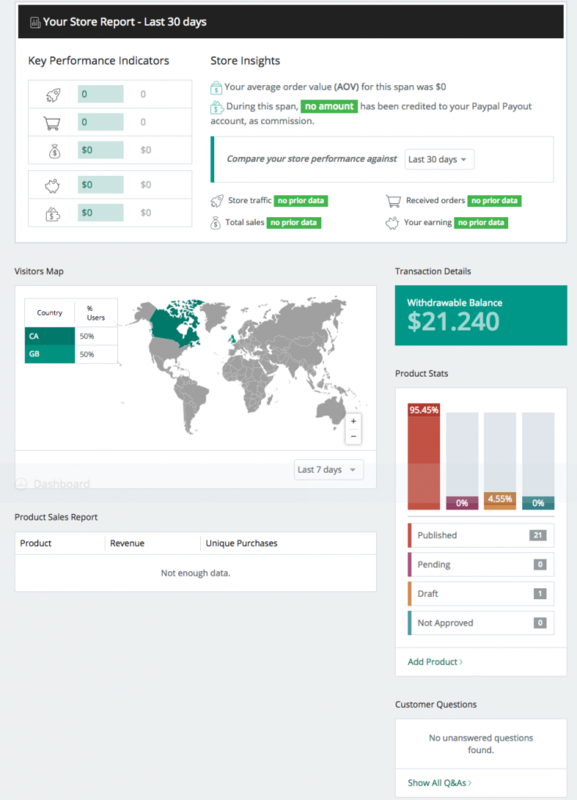 The Dokan Frontend hosts the vendor dashboard in a visually attractive platform in the store frontend. 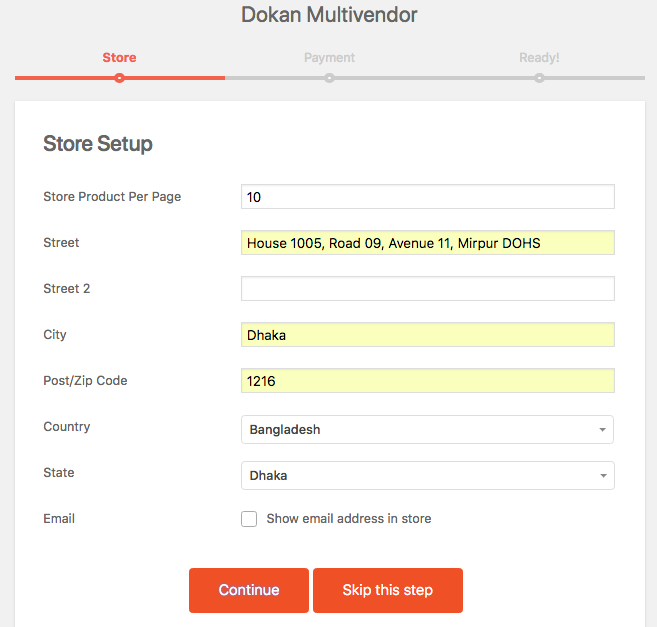 In Dokan plugin, vendors also get a Store Setup Widget when they register. This simple widget allows them to enter store slug, description, and payment details quickly and get some important stuffs out of the way, thus saving time and energy. 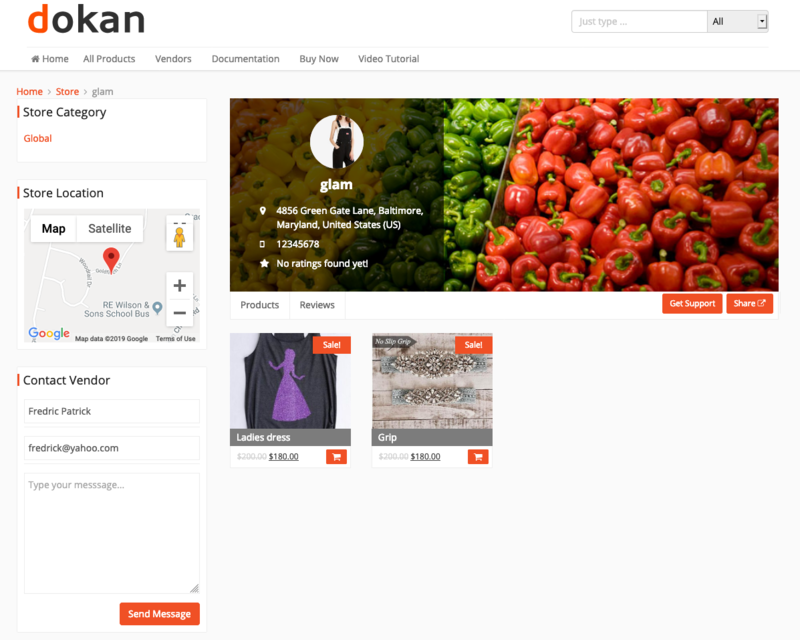 Best part is: Dokan Vendors easily get the feel of a personal eCommerce store and ownership. Dokan Vendor Dashboard can manage products, orders, coupons, withdrawals, return requests, reviews, booking and auctionable products. Vendors can also add their social profiles to their store, enter payment information from dashboard, manage shipping, returns and warranty, and SEO. In WC Marketplace, there are no separate store setup widget for vendors. WCMp offers an attractive vendor dashboard wherein the menu, options, and settings are laid out in a very simplistic way so that it's easy to search and navigate for users. The UI of the overall vendor frontend in WCMp is easy to understand. The overview page is an important feature of a plugin. For vendors, this page is a bird’s-eye summary of the state of their store. So it’s essential that it contains a good amount of important data. 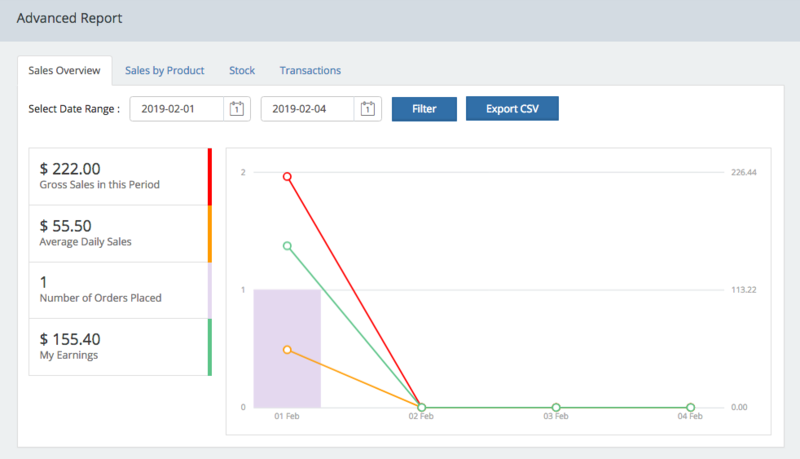 In Dokan Multivendor Plugin, the vendor overview dashboard consists of a visual chart showing the sales and number of orders in the current month. It also lays out the number of orders and products according to their status. The overview page also displays announcements from the admins and a simple stats showing earning, pageviews, orders, and total sales. All of these are clickable and redirects the vendors to the relevant page. The WCMp vendor overview is more rich and tells vendors the KPI and store insights for the last 7 and 30 days. Vendors can compare store traffic, number of orders, sales, earnings, and withdrawals. Vendors are also able to see a map of all visitors around the world and the regions where the visitors came from. The overview dashboard also shows withdrawable balances for a number of days, a simple product-wise sales report, reviews, pending customer queries, and a bar chart illustrating the status of the products in store. Product categories and tags benefit both admins and vendors in terms of SEO and Google Indexing. Moreover, it makes customer searches easy on search engines and within the marketplace. Maintaining a categorical hierarchy is also important to allow a product get more exposure on search SEOs for the right keywords. Dokan vendors compulsorily need to assign a product to a category. This encourages better product search for the customers on both search engines as well as on your website. Dokan allows vendors to choose multiple categories and create their own tags from the frontend. WCMp only recently made adding a category compulsory for vendors. Though multiple categories cannot be added, vendors can create categories if they've access to the backend. The SEO tool is a must have for any growing online marketplace as it helps to rank your store and products in search engines and exposes you to your audience. Both Dokan and WCMp allow vendors to set the preferred meta data for their shop page as well as their individual product pages. In Dokan, vendors can add SEO title and description separately for their store, Facebook page, and Twitter page from the frontend. Dokan Vendors can also do Product-specific SEO from the individual Edit Product page of each item. On top of that, Dokan frees admins from this duty and keeps it optional for admins to add Product SEO from the backend. 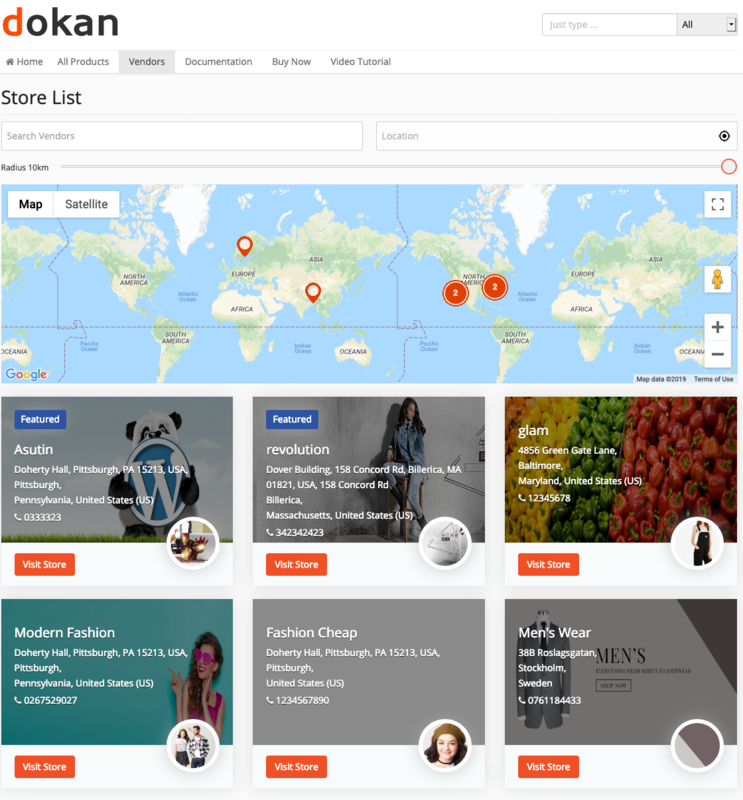 While in Dokan PRO, Product SEO and Store SEO are a built-in feature, in WC Marketplace this are a premium add on. In WCMp, vendors have to do Store SEO from the backend setting panel. Switching back and forth between backend and frontend can become a hassle that takes up time. Coupons in Dokan is a built-in feature. Vendors can create, manage, and edit coupons, set expiry dates, and a lot more. Dokan also lets vendors grant storewide discount for all products, define the min order amount and the percentage. 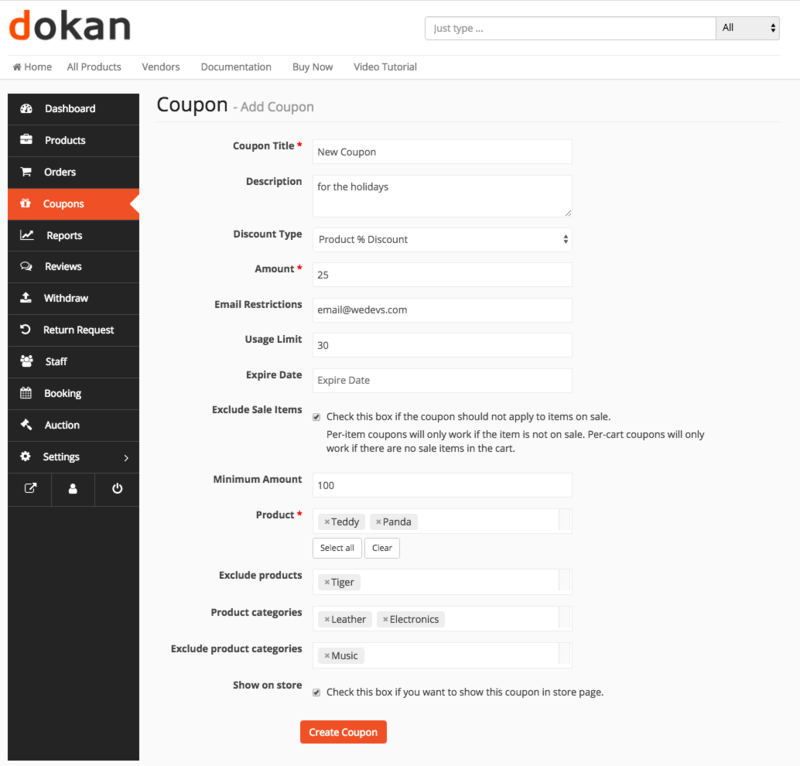 Dokan has a friendlier and more attractive interface and the options for coupons are just right for any seller. WCMP delivers the Coupons feature with Advanced Frontend Manager add-on which has a starting price of $100. It comes with extra options like minimum and maximum spend, email restrictions, individual use, limit usage on number of items and per user, and a more enriched discount type feature. Vendor reports let sellers identify problem areas and opportunities, streamline processes, reduce costs and improve efficiency. Sellers can view trends and spot best performing products. Reports also emphasize the link between financial and non-financial performance. Dokan vendor reports show monthly data like total sales, number of products sold, coupons used, shipping charges, and also sales by day or custom range, top earning product, top selling product, and statement for a custom range. The vendor reports feature of WCMp shows similar data but not in an illustrated graph like that of Dokan. The advanced report option of WCMp also show sales by product, stock and transactions data for any range of dates. In a WooCommerce Multivendor Marketplace you can avail advanced features by going for assorted extensions. This section will be comparing Dokan Multivendor Modules with WC Marketplace Add-Ons. The SPMV advanced feature lets vendors sell products of other vendors and show it side-by-side to shoppers in the marketplace. In Dokan, admins can change the text of the button that allows vendors to sell products of another vendor. Admins can also change the title of the available vendors list section and the position of the available vendor section. In WCMp, admins can only select the criteria to display for single product multivendor items. There are not a lot of other options offered for this feature. Dokan lets admins customize vendor dashboard color settings. In cases when admins are using third party themes, this useful feature lets them quickly adjust the color of the frontend dashboard to match the theme. Dokan color customizer allows an ample number of options for admins, like, Button text, Button background color, Button border color, Button hover text color, Button hover color, Button hover border color, Dashboard navigation text, Dashboard navigation active menu, Dashboard navigation background, Dashboard menu border. WCMp doesn’t have a feature that matches this though they provide few fixed pre-set default color schemes that are not customizable. Dokan has an exclusive feature for registered users to avail support from vendors which can be obtained via the store support module. This allows buyers and non-buyers to message the vendor directly and get better customer support. Vendors can provide assistance from the frontend. 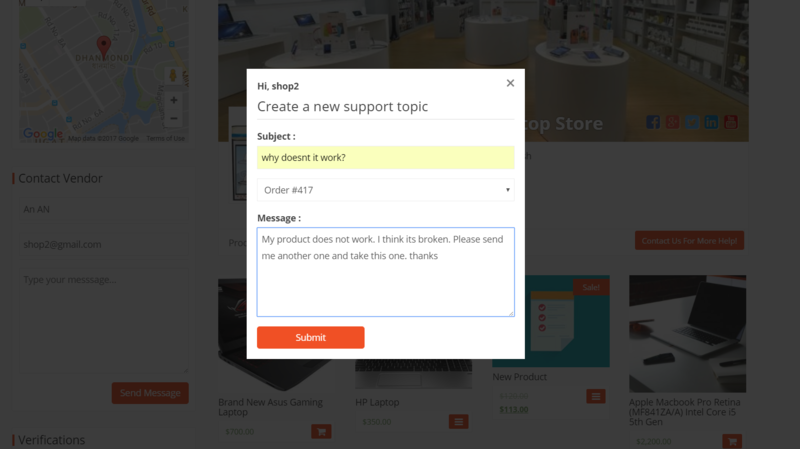 Create a support ticket right from the vendor store page. Select the order ID for their query. Write a subject for their query. Include a message they want to convey to the vendor. See all tickets from their account and also the status of each. Receive support tickets from their existing customers from the frontend. See support tickets directly from their dashboard. 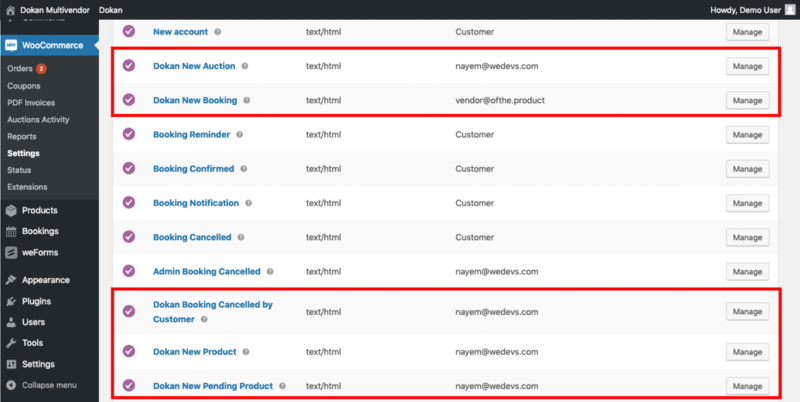 Get an overview with title, customer name, status, issue date of all the tickets. Exchange replies with the customer from dashboard. Close tickets if the issue is resolved. View the entire conversation carried out with the client. In WCMp admins also get a copy of the enquiring customer’s details in the backend dashboard. Both Admins and vendors are able to reply from dashboard but only vendors can manage, approve, reject, or delete enquiries. Insight: Though the WCMp customer enquiry feature definitely seems richer on the outset, a lot of the elements don’t come across as meaningful. From the vendor dashboard, you’re unable to view the customer’s name or email but have to open each enquiry to view the details. Moreover, the statuses: approved, published, rejected, expired – do not immediately make sense and are likely to be not very meaningful for most vendors. Dokan, on the other hand, keeps it simple with just 2 statuses: open and closed. As long as you are conversing with the client, you have an open ticket in your dashboard. When you’re done, simply change it closed. Dokan also has a more smooth and easily understandable dashboard for customer support that makes it simple for vendors to store and keep track of all their support tickets. Also consider the fact that WC catalog enquiry pro is $100 while store support module for Dokan comes along with 13 other modules and premium marketplace features for $249. So there’s a lot of more savings of around $80 per add on with the Dokan package. Dokan subscriptions lets admins create vendor memberships packs from the backend. Admins can create unlimited membership packages and simply have to choose Dokan Subscription as product type to get started. Admins can define the price, number of products that the vendor can upload for that package, admin commission type, admin commission, categories allowed, add attributes, and allow recurring payment. Unlimited custom attributes can be added. Admins can also allow vendors to buy subscription during registration, and configure the email subject, body, number of days before subscription expires, and the product status. When a vendor registers, admins can view it and manage directly from Dokan menu under Dokan>Subscriptions. With a simple layout and custom configurations, Dokan Subscriptions has kept it easy for admins of WooCommerce Multi vendor Marketplaces and WooCommerce Multistore Marketplaces to get started with earning from vendor memberships. WCMp Memberships lets admins is similar to Dokan Subscriptions. 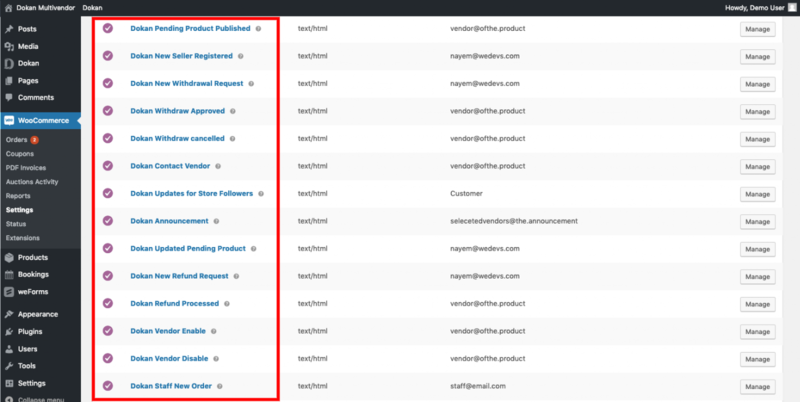 But the plugin lets admins configure different types of emails for subscription. WCMp also lets admins select the methods of payment he wants to allow vendors to use while purchasing a subscription. Admins can also customize the frontend layout of the subscription page by modifying the colours of buttons and texts. For managing subscription requests, WCMp admins would have to navigate to Vendor Type>Memberships. From this page, admins can define the particularities of each subscription package individually, such as, access privileges, billing, message, capabilities, limitations, upgrade, etc. The Memberships Manager of WCMp is also better, useful, and instantly meaningful the moment you look at it. In this way WCMp Subscriptions has more features that admins can choose to configure their membership packages. What can be better for shoppers than having testimonials and rankings to decide for themselves. Reviews let customers spot trustworthy sellers and make quick decisions to purchase. This feature also allows admins to identify authentic sellers in his marketplace. 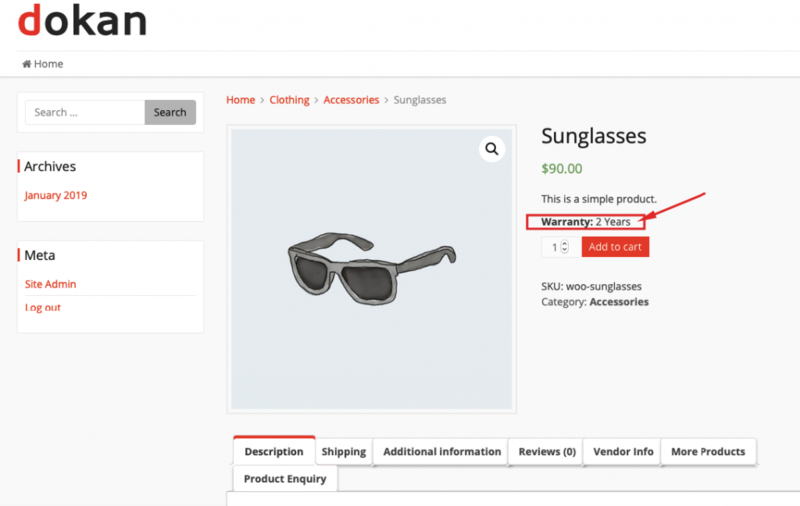 Dokan plugin brings WooCommerce’s default store reviews option to the frontend for vendors allowing sellers to only be reviewed by verified purchasers. Vendors can also moderate the reviews to control for spam and wrong comments. Moreover, Dokan plugin also displays the aggregate rank and number of reviewers in the storefront for better customer experience. Dokan plugin thus provides a better control to vendors on how they want to be showed. WCMp however takes a different approach, and admins can only allow or disable reviews, but vendors cannot manage themselves. 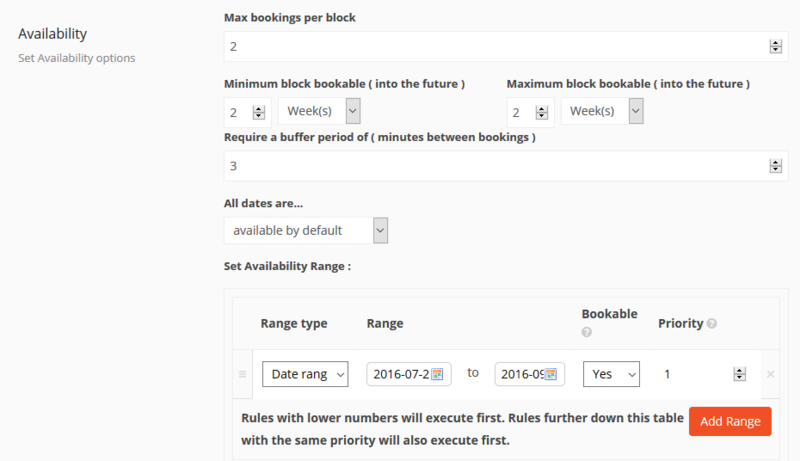 Though both Dokan and WCMp are integrated with WooCommerce bookings, Dokan plugin allows vendors to create a bookable product from the vendor dashboard for bookings. Thus allowing sellers to create bookable products and manage all bookings from one place. WCMp also allows vendors to send notifications and create bookings from dashboard. Dokan WooCommerce Auctions lets vendors add auctionable products from the frontend or create an auction store like eBay. Vendors can enter details auctionable products just like regular products, enable automatic relisting, proxy or sealed bidding for the product. Admins can configure settings from backend panel and the same can be done by vendors from frontend. In WCMp, auctionable products can be added from the vendor product manager. Admins don't have separate settings for the marketplace except for the default WooCommerce settings. Vendors are required to set it all up by themselves. Apart from this, there are no other noticeable differences with Dokan. 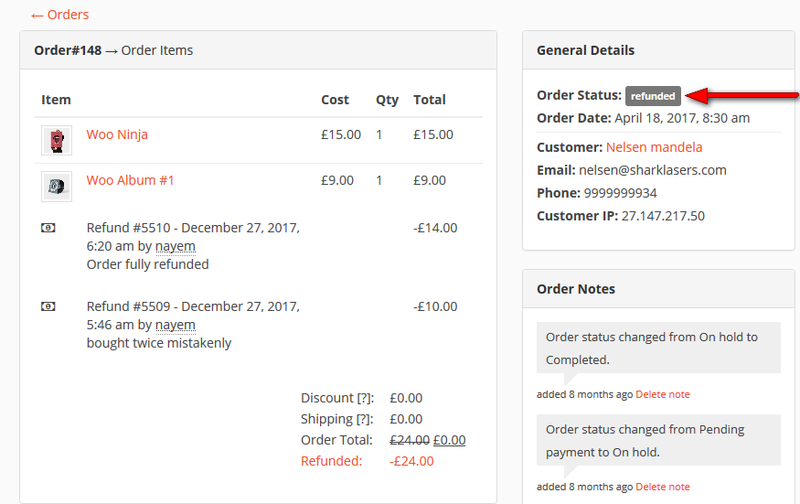 Dokan PDF invoices lets admins, sellers, and customers get their invoices in PDF. vendors can view both packing slips and invoice from the dashboard and download them as pdf. While the invoices of both plugins appear the same, it’s a free feature in Dokan and a paid add on inWCMp. In WCMp, admins also have separate control to configure the invoice details. 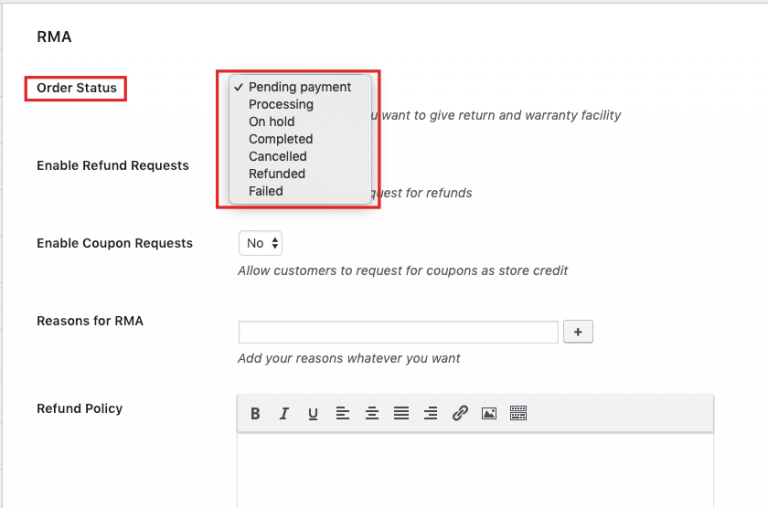 Though this is similar to the woocommerce PDF invoices settings, in wcmp admins can define the admin and customer invoice template separately from a set of predefined templates. Admins can select the details to show in the invoices, terms & conditions, and whether to send via email. Vendors can also select the template for their invoice and define the terms and conditions. 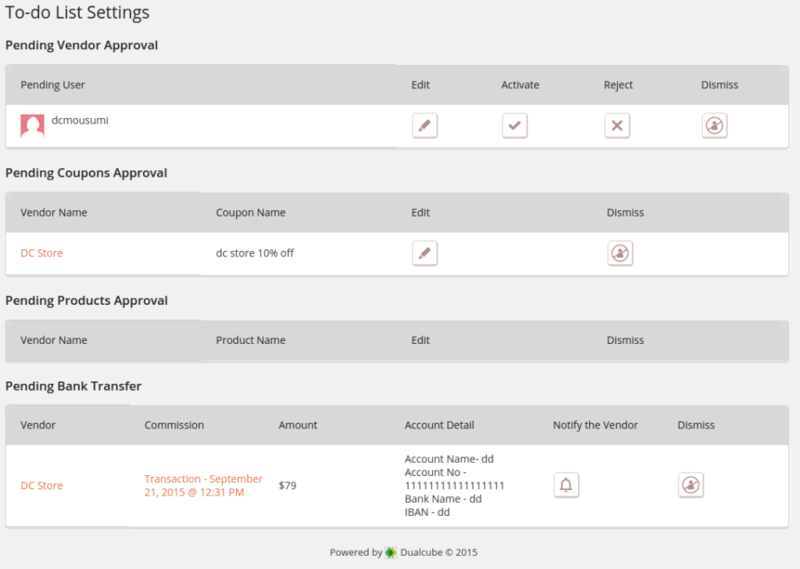 In both plugins, customers can view the invoices from their account and also have it mailed to them. 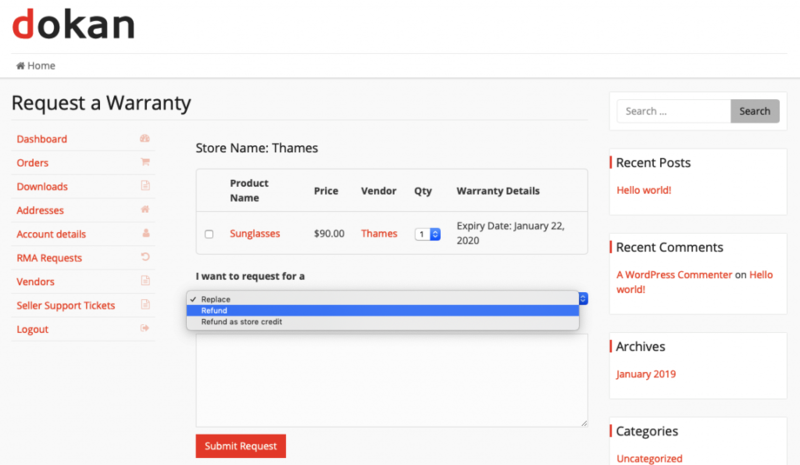 Dokan’s simple interface lets vendors close store temporarily. Vendors can select the date and leave a vacation message for his customers. When vendor is on vacation, purchasing options is closed. Wcmp plugin lets vendors select multiple dates together, and select if he wants to avoid customers. Vendors are also able to configure custom notifications to avoid purchase and set notification threshold. This add on lets vendors change the Add to Cart button text and add any custom message along with it. This, however, is a default feature in Dokan. In Dokan plugin, the store time option comes as a module and sellers can set hours of operation for every day of the week. Sellers can also set custom text for store opening and closing. Admins can choose to disable the store opening and closing time widget from backend. In wcmp, vendors are able to configure store opening and close times for every day of the week, add custom text after store closes. However this feature comes with the vendor vacation add on only. Vendor verifications are an excellent way of exhibiting assurance to customers about the genuinity of sellers. Vendors have the verified label or batch in their stores and products are also likely to be trusted more by users, have more sales, and become long term clients. Dokan plugin lets vendors verify with social profiles, SMS, ID and address. The SMS method includes popular gateways like Nexmo and Twilio. WCMP allows vendors to verify using social profiles, ID and address. Dokan plugin now makes it easy for vendors to login using their social media accounts. This includes Facebook, Twitter, Google, LinkedIn. Users can both register and login using these social profiles to start selling. Dokan also lets admins approve verifications before they can be displayed on the vendor’s profile. These verification requests are displayed in a separate and easy dashboard in the admin backend. Admins can individually approve IDs and addresses and phone numbers are verified via an SMS code. In WCMp, admins can view verification requests in the to-do list. In Dokan, vendors can export and import products in csv. format from the frontend product dashboard. The options are placed directly in the product dashboard so sellers can access them quickly. Admins are freed from any extra settings for the import-export module. Whereas, in WCMP vendors have to create a separate page for uploading products to export and import. Thus admins have to go through some extra steps to set up the feature for his vendors to use. The WCMp staff manager for sellers is a simplistic version of Dokan vendor staff manager. Not only is the user interface far superior, but Dokan also allows vendors to precisely configure the permission settings for each staff. The comprehensive range of permission controls for each multivendor element like orders, reports, reviews, products, coupons, etc. makes it easier for vendors to have manage a large number of staffs smoothly. Since the admins already have a lot in their hands, like vendor payments, registrations, orders, refunds etc to manage, this module is one of those that frees admin of extra hassles and lets the vendor take over. 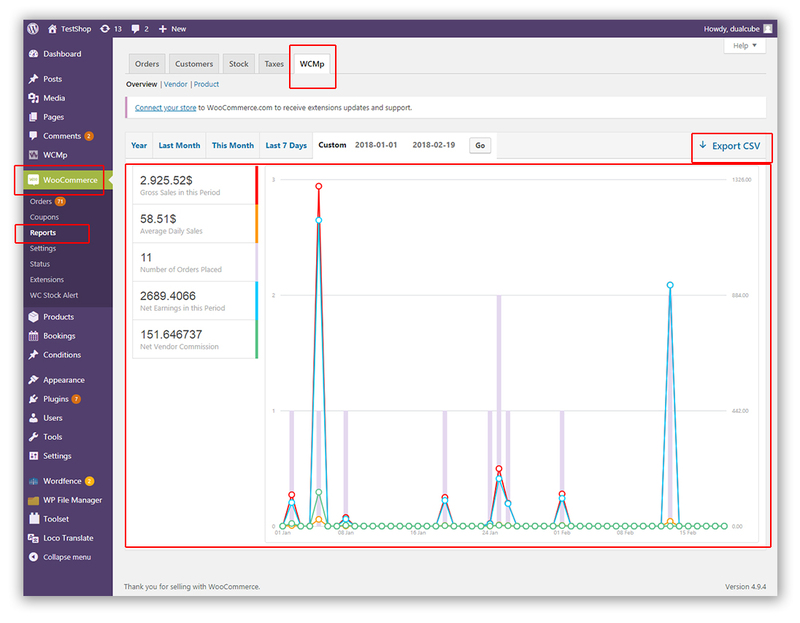 This is one of the features that shifts the task to the vendor’s side. Dokan uses a variety of payment methods, one of them being MOIP, with which admins can set automatic payments to vendors. The core version of dokan allows admins to use any gateway that’s non-adaptive and compatible with WooCommerce. If admins want to use an adaptive gateway, they can use the Stripe Connect module, which is a popular payway and is used around the world. This module allows automatic commission disbursals to vendors and releases admins of some extra tasks, like manually splitting amounts between vendors and configuring transaction fees. Customers can directly checkout using credit card or even use direct bank transfer. Adding other popular gateways and 100+ WooCommerce supported gateways will enable your market to sell in any country, with tax rates built-in. WCMp lets vendors select their own payment methods such as Paypal Masspay and Paypal Payout as well as stripe. In WCMp, admins can choose to automatically disburse commissions or allow vendors to request for withdrawals. Doing the latter, shifts the burden of action to the vendors. Paypal gateway is the core payment feature in WCMP, but the marketplace plugin doesn’t use as many payment gateways as Dokan. How do you make customers spend a fabulous and smooth time with your marketplace? Give them instant real-time support, a frictionless searching experience, and keep them updated about their favourite products. There you go! Some features are priceless and deliver timeless value. Dokan plugin incorporates a great search feature for browsing which shows suggestions as users type. 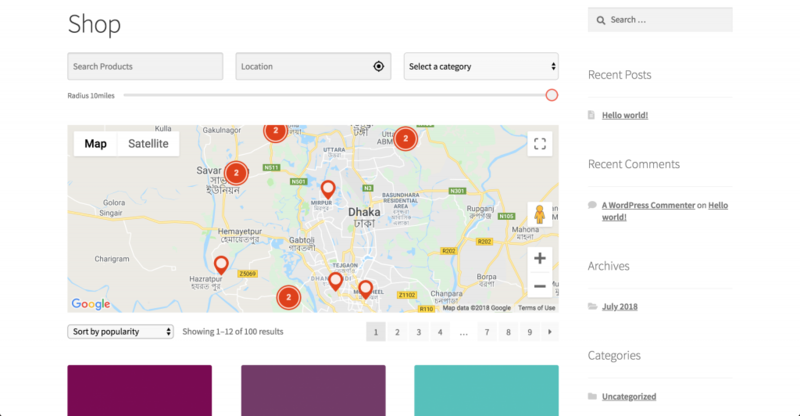 The live search feature of Dokan Multi vendor lets customers search for products using simple keywords and get instant results as they type. The Dokan Talk JS live chat support option creates a ground for vendors to directly & privately interact with visitors on a real-time basis, solve issues faster, and convert interested users into paying clients. Instant conversations & faster resolutions to clients’ needs are the new hot thing for high retention & sales. Live chats also help to understand users better. Thus allowing sellers to understand potential customers, what they are looking for and their needs. Dokan lets vendors and customers chat from anywhere in the store. 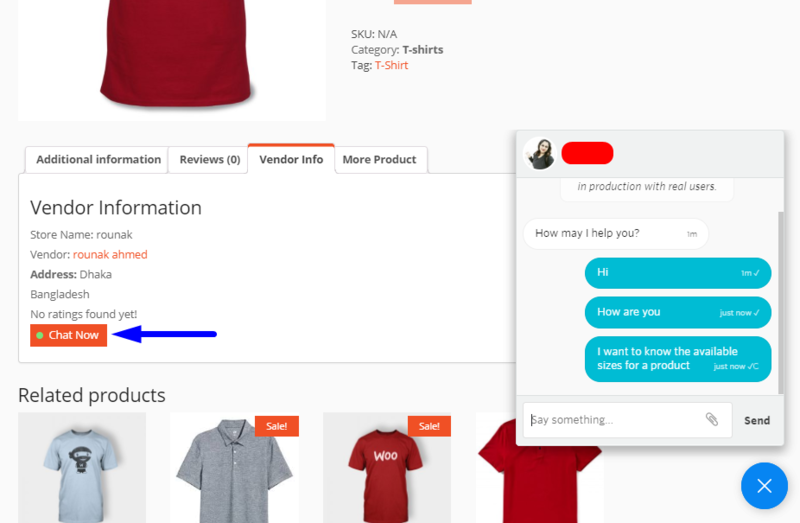 Vendors also get the live chat conversations stored in their Inbox in frontend dashboard. Vendors can also receive desktop notifications and reply to offline messages from the Inbox. 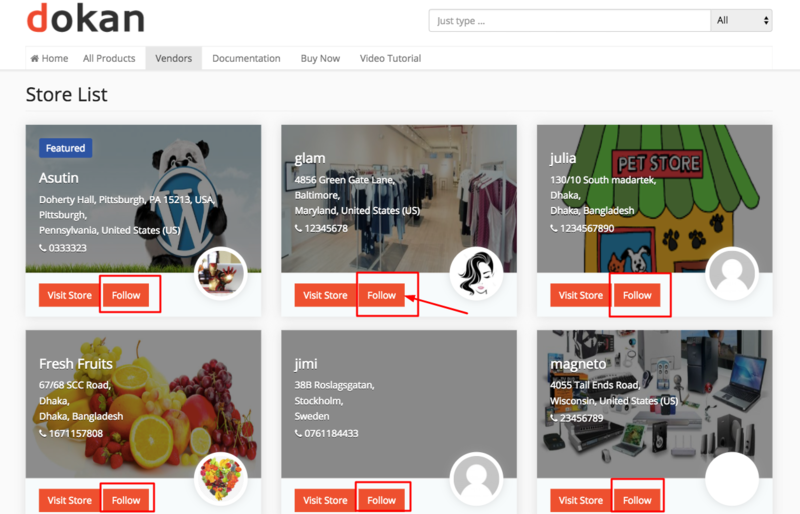 The follow store option lets users keep tabs on their favourite stores and stay updated about new products. There are no substitutes to these elements. They keep your users hooked and make them come back again and again. Features like these do wonders to transform the online shopping experience and users simply love it. 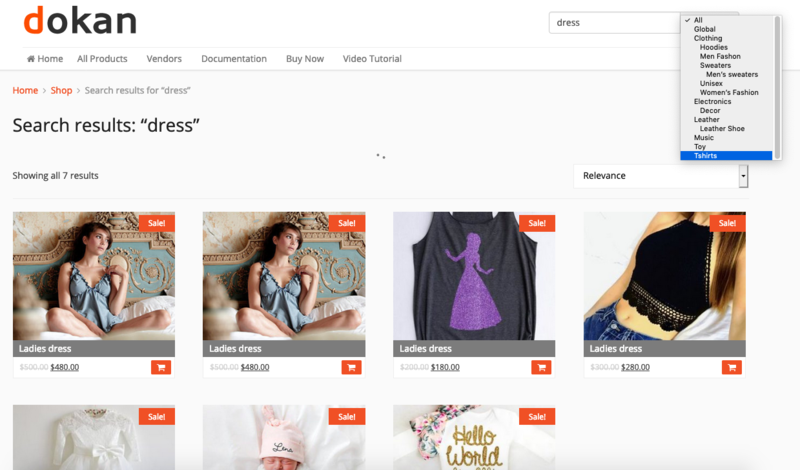 With so many stores in a multivendor marketplace, sellers try to stand out and personalize their stores to attract the right customers. There are tons of way to personalize a store, such as, adding brand logo, using a theme color, optimizing with keywords, adding a location, and a lot more. The ShipStation option fully automates Dokan shipping so that vendors can ship products anywhere in less time. Import, manage, generate labels, and ship the orders hassle free. One of the best ways to let customers find your store is through searching with your name or product within a certain region. 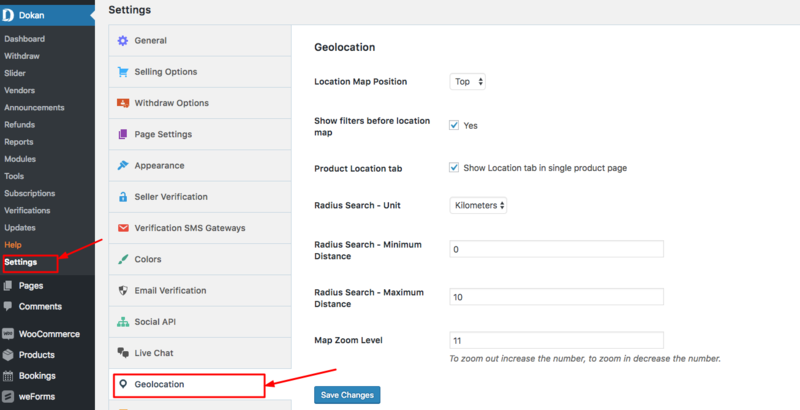 The Dokan Geolocation module allows users to search for products and vendors in a specific area or radius. Dokan also lets visitors contact vendors with a simple Product Enquiry form. Visitors can just leave them email address and message, and vendors can reply through email. For customer satisfaction, Dokan lets customers request for return with full or partial refund, get replacement for a product, or refund as store credit. Vendors can also provide warranty for all products or individually and include it with the item or as add-on. 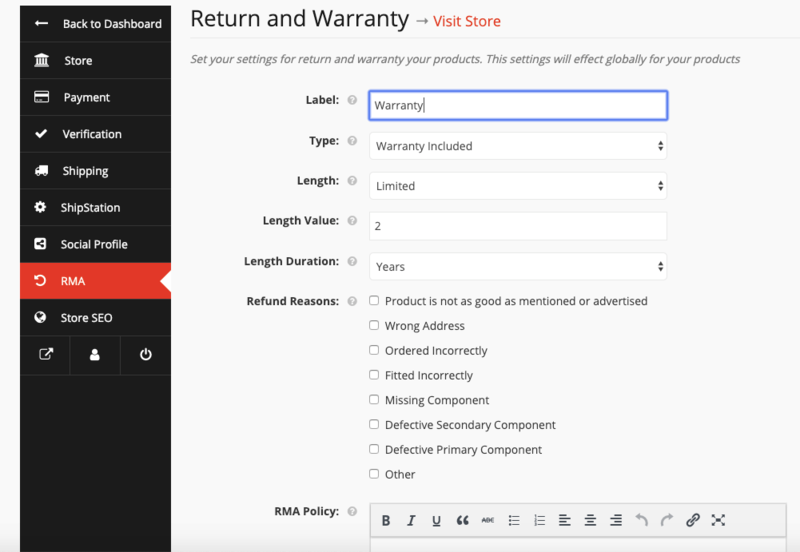 Admins can control the return policy while vendors control the warranty policy. 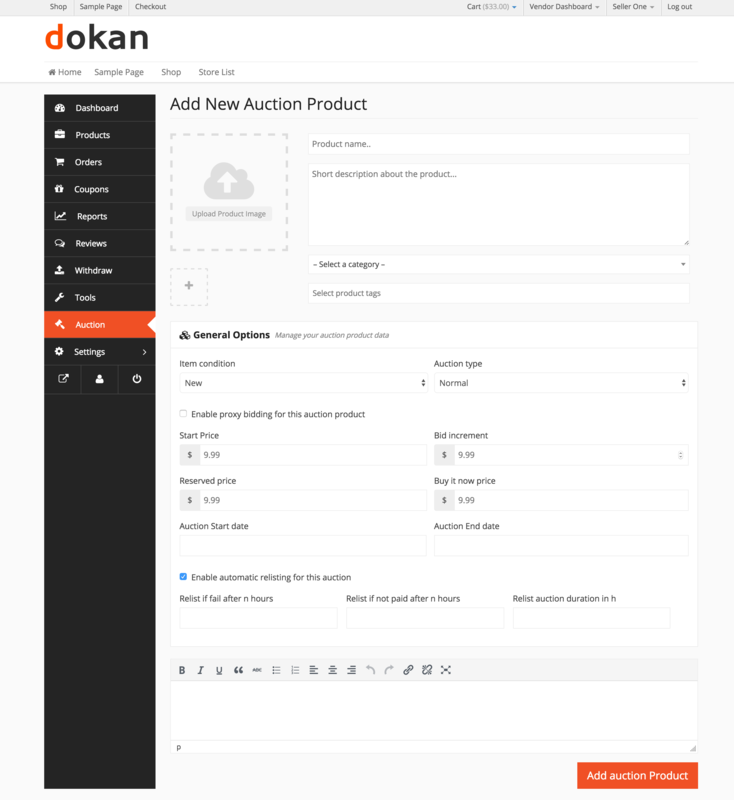 Dokan plugin lets vendors offer their products at a wholesale price. With this feature, vendors can set the minimum quantity to avail the wholesale rate and the price. Users can become a wholesale customer. And vendors can set product specific rates for any type of product, like, simple, variable, etc. Dokan is multilingual ready, making it easy for admins and vendors to sell in regions of their choice and make their marketplace customized for a foreign audience. The free WPML integration makes Dokan translatable in 25+ languages and RTL supported, so your eCommerce is truly global. Dokan has 14 widgets – one of the best proofs that this multivendor is flexible enough for marketplace owners to re-organize and modify the layout of pages just as desired. These widgets, such as, the dokan best selling products, best vendors, featured vendors, geolocation filter form, product category menu, product location information in single page, seller store category menu, vendor contact form, store location, store opening closing time widget, store support button, top rated product widget, seller verifications, live search field – are extremely handy tools that allow admins to place certain features wherever they want to around the website for better appearance, easier access, and user convenience. Dokan also comes with a free marketplace theme that instantly sets up all the pages, vendor dashboard, and widgets so that you are ready to get down to business. Grab it now at the best price! WC Marketplace has a well-built free version and some add-ons have been built very rich. But this multi seller solution falls behind in innovating. WC Marketplace doesn't yet provide marketplace vendors ways to transform their eCommerce shop into whatever they dream about. 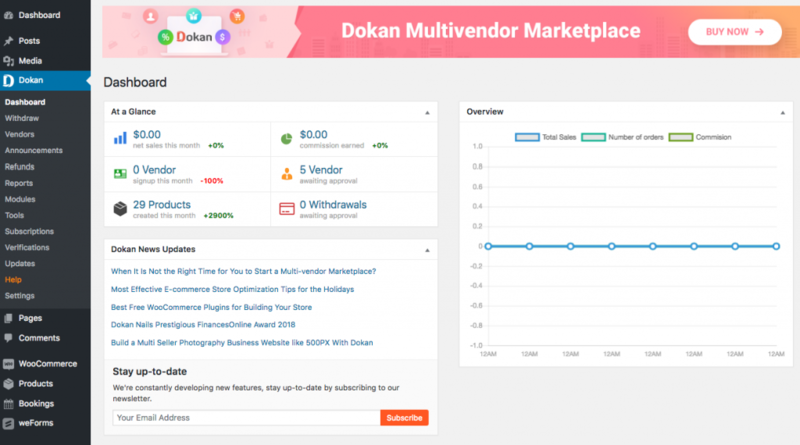 Dokan Multivendor is a flexible Multi Vendor Marketplace WordPress plugin that has more to offer, and is a Complete Multi Seller eCommerce solution that balances the control of power between the admins and vendors. While it rightly allows admins crucial exclusive control over certain important elements of multivendor ecommerce to prevent violations, it also empowers vendors sufficiently to configure, setup and run their own stores independently and relaxedly. Dokan is also extremely feature-rich and brings new features faster than anybody else. Users commonly praise the uniqueness of elements in this multi seller marketplace platform. And if you use Dokan, you’re sure to come across exclusive features that you won’t find anywhere else. Because Dokan develops and it does too fast! For this reason, it’s not difficult to find other competitors ripping off Dokan features and selling them for free or for less. Dokan followers still fall back when it comes to meeting the standards set by the developers of Dokan Multi Vendor and in racing ahead to implement original and unique features. 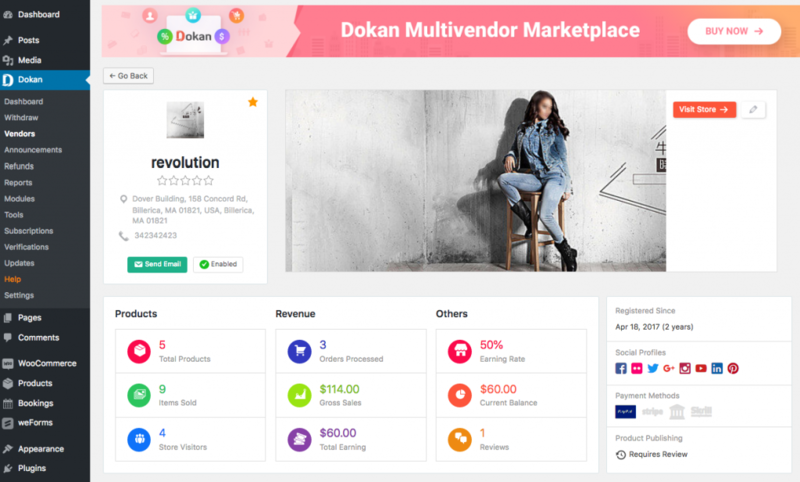 Dokan Multi Vendor thus provides easier admin controls, smart reports, advanced vendor store customization options and an improved customer experience for eCommerce shopping. Get easier admin controls, smart reports, advanced vendor store customization options & an improved customer experience for eCommerce shopping. 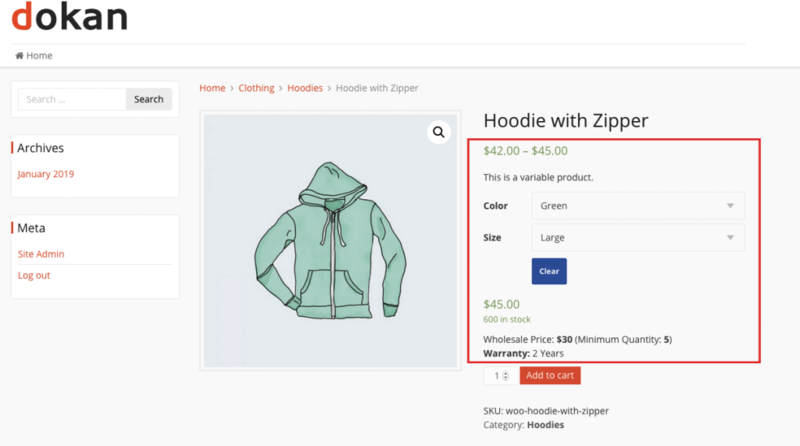 The real solution for WooCommerce Multiple Sellers is here! Discount offer valid till 22nd March, 2019 only. Hurry up & grab the deal today!